Breaking News: Amazing Summer Interns Have Taken Over! 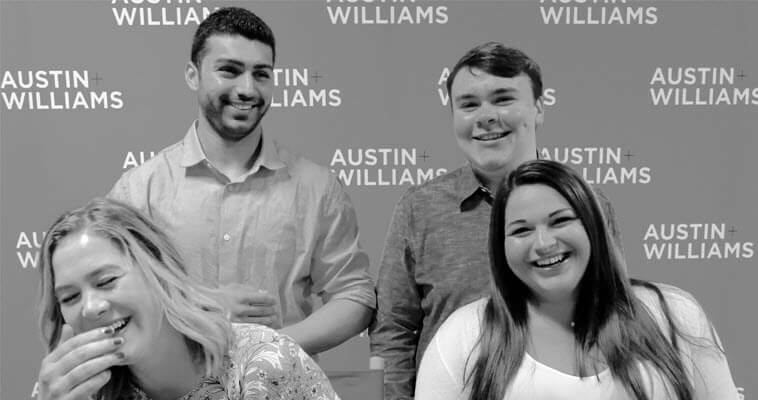 Just when we thought we couldn’t possibly have a better team here at Austin & Williams, four new talented interns proved us wrong. In fact, they’ve become such integral members of the agency and have been kept so busy that we forgot to show them off! Meet our summer intern dream team: Ashley Lane, Daniel Denning, Kabir Bharara and Kaela Pflumm. When Ashley Lane, of Levittown, NY, (lower right) decided to pursue an internship during her summer break from Mount Saint Mary College, where she’s entering her junior year as a business major, she had no idea just how hard she’d fall in love with account management. In no time at all, Ashley has learned the account ropes—processing change orders, creating and tracking jobs via our internal programs and sitting in on status calls with clients. Now that she’s peeked behind the curtain and seen just how vital a good account manager can be, she’s eager to become one herself—until she wins the lottery and buys a yacht, of course. If you were lucky enough to be stranded on a desert island with Daniel Denning, our media department intern, you’d have nothing to fear thanks to the water purification device and flares he would bring. Daniel, of Medford, NY, (upper right) brings this level of practicality and pragmatism to the media team. The Syracuse University advertising major who will be entering his junior year this fall has spent his summer learning the ins and outs of Google AdWords and Analytics, writing media POVs and finding out just what remarketing is exactly. He’s learned many industry-wide lessons here that he’ll undoubtedly encounter time and again—except, maybe, an office that routinely functions with cute dogs running around. That’s an A&W thing. Not many kids grow up with visions of digital marketing dancing in their head… including our digital marketing intern, Kabir Bharara, of Syosset, NY (upper left). Now that Kabir has spent his summer break from SUNY Farmingdale—where he’ll be entering his junior year as a business major—unearthing the joys of reading and analyzing Google Analytics data and preparing client reports, he’s set his sights on a career as a digital marketing analyst. When he’s not perfecting SEO tactics, crafting wide-reaching social media posts or engineering pay-per-click concepts, Kabir’s enjoying good food and music and dreaming about owning a yacht (maybe Ashley will share!). Some may think there’s nothing new you can learn about writing, but our copywriting intern, Kaela Pflumm of Dix Hills, NY, (lower left) would take umbrage with that. Kaela, who’s entering her senior year as an English major at Stony Brook University, approaches copywriting with the same fun-to-serious ratio as when she’s asked what she’d do if she won the lottery (buy a dog and pay off her bills). While most college kids spent their summer on the beach (where she’d need LOTS of sunscreen and an umbrella), Kaela’s learned the art of a successful blog post, the different ways to write for radio spots, brochures and websites, what “evergreen” means and how to utilize all of the Microsoft Word benefits without the help of Clippy the Paperclip. Kaela looks forward to a career as an ad copywriter or magazine writer, but has steeled herself for the realization that few workplaces dedicate whole days to food and drink like A&W—we’re looking at you, Margarita Monday and Wiener Wednesday!